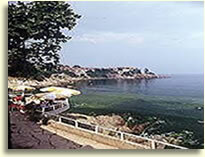 North of Varna there is a cluster of seaside resorts all with fine sandy beaches but differing in size and style. 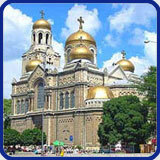 Situated 17 km north-east from Varna right on the shore. Peace and quiet reign over the beautiful parkland with rare plant species, calm bays with fine sand contribute to the atmosphere of coziness and immaculate luxury. The six hotels at the Riviera Holiday Club (Imperial, Oasis, Lotos, Nimpha, Rousalka and Romantica) can accommodate a total of 550 guests. Riviera is a renowned exclusive center of business tourism, which offers excellent environment for convention – and business meetings and enjoys an array of technical support and room facilities. Ten kilometers north of Varna, a quiet bay in the resort of St.St.Constantine and Helena has given shelter to the Sunny Day Complex. It meets all the requirements of the club type of tourism: luxury hotels, a wide beach strip of fine golden sand, a yachting marina, playgrounds, a tennis court, facilities for spa treatment and preventive medicine. Away from the hustle and bustle of large beach resorts, the Sunny Day Complex offers the best conditions for holiday makers to rest, relax and enjoy the sun and the sea. Sunny Day is a posh place for holiday and relaxation located at the far end of a secluded scenic bay with fine sand beaches just 10 km away from the Bulgarian town of Varna. 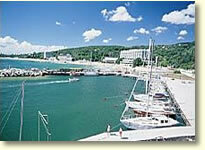 Albena is located in a picturesque bay in the north part of Bulgarian Black Sea Riviera. It is a fairy tale place where you will be in a full harmony with nature. The sea water here is crystal clean. The sea is with shallow bottom and the beach strip is 7 km long and 150 m wide.